All great buildings, no matter the size, start with great design. We’ve been thinking about our old age to a time, where we could live in wonderful locations around the country. One way we’ve been giving lip service to is buying one of the wheelies described in this post. It’s an RV (movable on wheels—basically a RV trailer) but with panache to the point of me conjuring up tales of how Frank Lloyd Wright designed it. He didn’t. Yes, we could travel to every nook in this wonderful country and when we weren’t on the road we know of a perfect corner in my oldest son’s backyard behind the house and between the creek that runs along his Pleasant Hill, CA property, where we could camp out (until we wear out my welcome). Of course, our conversation drifted to the fact I lack outdoor spirit. My idea of a movable feast when traveling is to never wander farther than room service will allow. 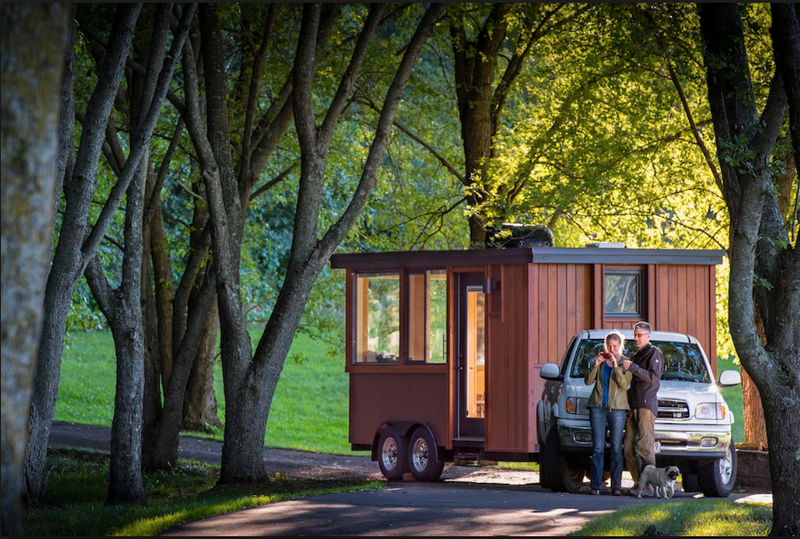 But, to more adventure some souls location flexibility is the beauty of these attractive tiny homes on wheels. We all have ideas where we could plant them, right? I’ve got my eye on two styles. 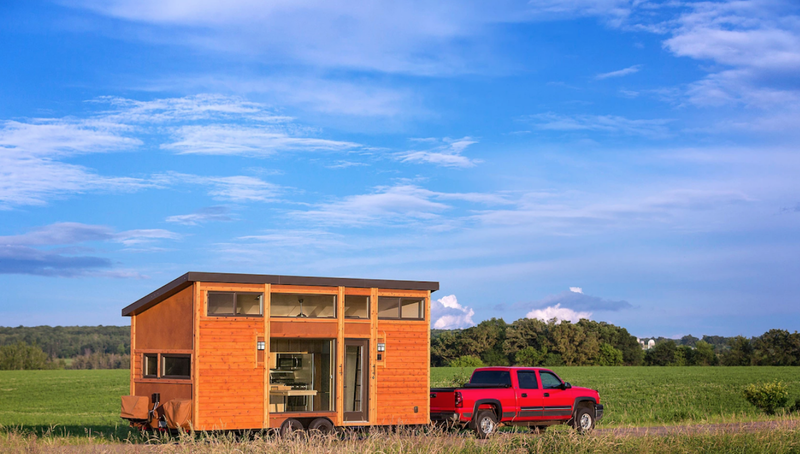 Both manufactured by Escape, a maker of hand-crafted RVIA-inspected tiny mobile homes (see pictures on this post) out of the company’s Rice Lake, Wisconsin plant. 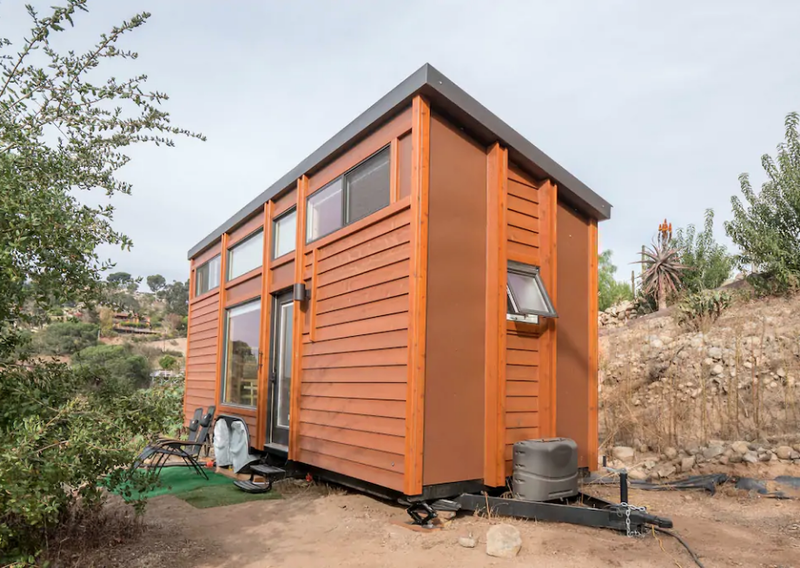 First, there’s the smaller units called the “Vista,” which comes in three options — including a 21-foot model that’s perfect for a moveable guest house or home office and the (even more) mobile 16-foot “Vista GO,” which was designed with weekend getaways in mind. 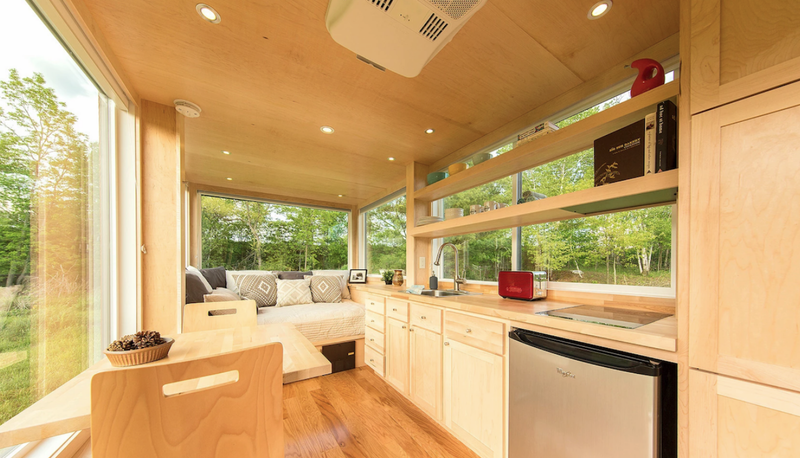 Prices start at $38,600 for the smaller Vista GO trailer. Next, my eye went to the “Traveler, which is 25 feet long, with 269 square feet of living space and features cedar lap siding with pine interiors. This light-filled mobile home starts at $66,000. Escape has a network of “live-in” showrooms around the country. The privately owned one that got my attention was the “Traveler” that was set up in a San Diego area backyard (with great views by the way). Smart buyers can “sleep in” before they buy. The San Diego tester (Traveler unit) is set up as an Airbnb and rents out at about $70 per night. Details are available on Escape’s website. Click here. All great buildings, no matter the size, start with great design. Working in conjunction with Kelly Davis, Principal Emeritus with SALA architects, Escape has developed pleasing designed matched with utilitarian elements. 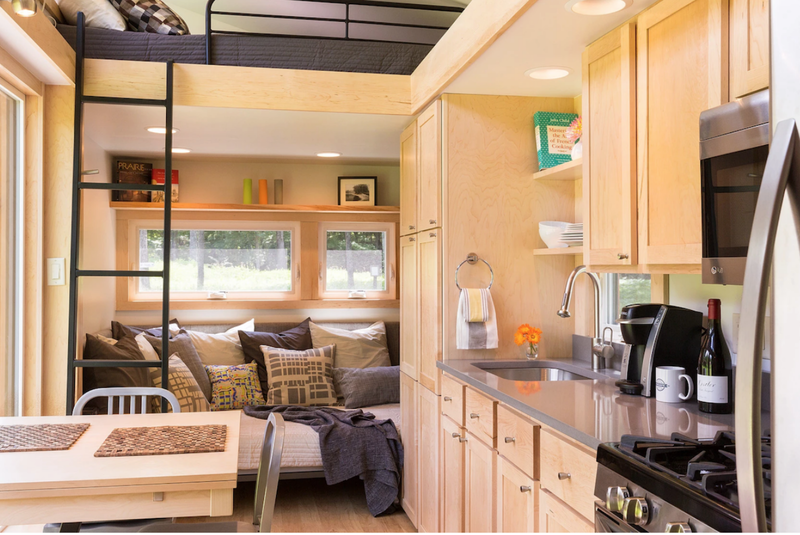 Great architecture is now available in smaller, livable stylish mobile homes. Escape’s Traveler and Vista were conceived as a high quality cottages, not an RVs. Inspired by All-American architect Frank Lloyd Wright’s celebrated attention to detail and appreciation of nature, every element of the Escape has been finished to the highest quality standards, featuring cedar lap siding, LED lighting, Energy Star appliances and much more. With remarkable architectural detail and beautiful furnishings, this is hardly your standard RV, but rather an object of repose that enhances the beauty of any natural setting. For the past 25 years Escape’s team has been designing and building award winning Tiny homes. Rather than feeling small, dark and cramped, the designs are based on light and a feeling of openness and space. Since 2014, all Escape units have been hand-crafted in a RVIA Inspected plant and are designed for extreme climates including heavy snow, brutal cold and searing heat. Common features in our units include panoramic windows, full kitchens, large bathrooms, large first floor bedrooms, washer/dryers, plenty of storage, full climate control, LED lighting and Off grid options. Escape delivers directly to customers nationwide using in-house trucks & factory reps and there are solid on-site warranties available. Escape’s home base is in Rice Lake, WI. There you can see most of units, if they are not traveling, weekdays from 10am-2pm by appointment. Just call 844-696-3722. ​Or better yet, there are now privately owned units from Miami to Seattle, New England to San Diego and most points in between. There are units on multiple islands in Hawaii whose owners have chosen to use Escape Traveler or Vista homes units as rentals or allow others to visit and explore. And, of course in the Wright spirit.